World 125cc motocross champion Jamie Dobb dealt his rivals the first psychological blow of the season when he took his brand new KTM 250 to victory in all three of his races at the Hawkstone Park International on Sunday. Taking an early lead in each of the 25 minute plus two lap races, Dobb left star names like 250 world champion Mickael Pichon and 500 world champion Stefan Everts trailing in the distance. The non-championship meeting was the only chance British fans are likely to get this year of Dobb and the other top international since there is no British GP this season. And Dobb gave the 10,000 strong crowd plenty to cheer – even though he said he riding at cruising pace. Dobb said: " At this stage of the year I’m only really riding to 80% of my potential so to do what I did today makes me really happy. I know Pichon crashed and had to come from a long way back in the first moto but I was cruising along until he started catching me. As soon as I got my pit board to say he was closing I upped my pace and he never made any more impression on me after that. I could have gone faster.
" Now I just need to continue my training and I’ll be 100% when the season starts at Valkenswaard, in Holland on March 24. " Dobb has spent time training in the States but his only previous competitive race since winning the 125 world title was the NEC Supercross before Christmas, which he also won. But in that meeting he rode a hybrid machine with a 200cc engine slotted into a KTM125 rolling chassis. The combination of light weight and user-friendly power suited the tight indoor circuit. Hawkstone was his first race on the KTM he’ll ride in the 250 world championship. He said: The bike feels good for something so new. We might make some small changes to set-up but it’s me that needs that extra 20%. " Brits filled the top three places in the Hawkstone Open class. James Noble, from Whitby, and Stuart Flockhart, from Longniddry in Scotland, completed the podium – both making their debut for the RWJ Honda team on new CR450Fs. Noble was runner-up overall and finished a closing second to Dobb in race two. Noble rode a KTM four-stroke last year and said: " I can’t believe how quickly I’ve been able to adapt to the new Honda. It’s lighter, smoother and faster than the bike I raced last year. I think the bike has opened a few eyes today. " Flockhart was equally impressive, taking the holeshot in all three races with his best race finish a fourth in the final race. He said: I can’t believe I was first out of the gate in all three races. First race I led for a while but tensed up and crashed but after that I was able to relax and enjoy myself. " Frenchman Pichon finished second in the first moto after crashing on the first lap but didn’t take any further part in the meeting. His fingers were trapped between the bar and the lever and were so swollen he couldn’t grip the bar to start the second race. His new works Suzuki team-mate Sven Breugelmans suffered a suspected broken leg in a first race crash. 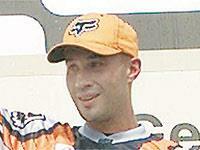 Everts failed to live up to promise and finished fifth overall. Fellow Belgian and Yamaha team-mate Marnicq Bervoets’ 500 four-stroke was plagued by a misfire. Another Belgian. Patrick Caps completed a great day for the KTM marque by taking the 125 class overall. 125 overall 1 P Caps, Belgium (KTM) 58 points, 2 M de Reuver, Holland (Yamaha) 56 points, 3 K Strijbos, Belgium (Suzuki) 38 points.